The pesticide residue testing market, in terms of value, is projected to reach USD 1.63 Billion by 2022, at a CAGR of 7.0% from 2016 to 2022. Implementation of stringent food safety regulations, increasing chemical contamination outbreaks, international trade of food materials, and advancements in testing technologies are some of the factors driving this market. The key players were identified through secondary sources such as Codex Alimentarius Commission (CODEX), Centers for Disease Control and Prevention (CDC), The European Federation of National Associations of Measurement, Testing, and Analytical Laboratories (EUROLAB), and Food and Agriculture Organization (FAO), while their market share in respective regions have been determined through both, primary and secondary research. The research methodology includes the study of annual and financial reports of top market players, as well as interviews with industry experts (such as CEOs, VPs, directors, and marketing executives) for key insights (both, quantitative and qualitative) for the pesticide residue testing market. This research report categorizes the pesticide residue testing market based on type, food tested, technology, class, and region. 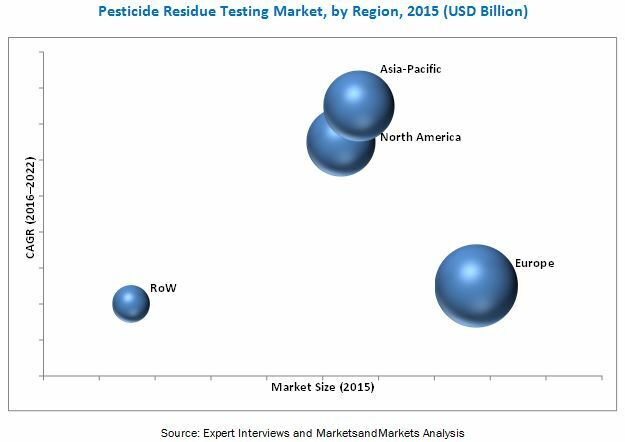 The pesticide residue testing market size is projected to reach USD 1.63 Billion by 2022, at a CAGR of 7.0% from 2016 to 2022. The market is driven by advancements in testing technologies, the global movement of organic revolution, implementation of stringent food safety regulations, and international trade of food materials. The global market, based on type, has been segmented into herbicides, insecticides, fungicides, and others which include acaricides, nematicides, rodenticides, and disinfectants. The herbicides segment is projected to be the largest and fastest growing in pesticide residue market through 2022. Some of the major herbicides include glyphosate, atrazine, 2, 4-d, dicamba, and trifluralin. Examples of insecticides include permethrin, aldicarb, and chloropyrifos. The global market, on the basis of technology, is segmented into LC-MS/GC-MS, HPLC, gas chromatography, and others such as immunoassay and other test kits. The LC-MS/GC-MS and HPLC are the two largest technologies used in the pesticide residue testing. LC-MS, which is a combination of liquid chromatography with mass spectrometry, is a powerful technique that has very high sensitivity, making it useful in many applications. HPLC is the second largest technology used to detect residues in the food. The increase in the convenience and ease of use of chromatography devices is increasing the adoption rate of chromatography instruments in food safety testing. The global market, based on class, is categorized into organochlorines, organophosphates, organonitrogens & carbamates, and others which include pyrethroids and fumigants. The organochlorines segment is projected to be the largest and the fastest growing class of pesticide residues in the pesticide residue testing market. Organochlorine pesticides include heptachlor, endosulfan, chlordane, and mirex. These pesticides are applied on fruits & vegetables to interfere with the ion channel receptors in insect neurons. The fruits & vegetables segment, based on food tested, is the fastest growing segment for pesticide residue testing market. The pesticide residue testing market was dominated by the European region in 2015. The growth in this market is driven by the presence of large number of food industries and stringent regulatory laws, as well as the fact that it is the largest international trader of food products. Asia-Pacific is projected to be the fastest growing market owing to the growth prospects in countries such as China and India among others. This is due to the growing need for food safety and expansion of various food industries and testing laboratories. Lack of food control infrastructure & resources in developing countries and lack of awareness about food safety regulations among food manufacturers are the restraining factors in the pesticide residue testing market. Some of the leading players include Eurofins Scientific SE (Luxembourg), Bureau Veritas S.A. (France), SGS S.A. (Switzerland), Intertek Group plc (U.K.), and Silliker, Inc. (U.S.). Eurofins focuses on increasing its geographic presence through acquisitions, which is evident from the number of acquisitions it has undertaken from 2011 to 2016. These acquisitions will help Eurofins Scientific in reinforcing the company’s network and analytical capabilities to better serve the food and agricultural industries. With expansions, the company focuses on strengthening its food testing laboratories in the Asia-Pacific region. In 2016, Eurofins expanded its presence in Asia-Pacific, by increasing its capacity with an advanced food testing laboratory in Singapore to serve the growing food & beverages market in the region.